Focus on process versus outcome. For his project week at school a couple of months ago, he presented on the Affordable Care Act and the current administration’s plans with respect to healthcare. It was an extremely sophisticated and ambitious topic to tackle for a 12-year-old. We tried to dissuade him from doing it and encouraged him to do something that he could have more fun with, but he wanted to do it. He did a great job and was asked to present to the high school students, but the teacher marking him gave him a ‘pass’ and not the ‘superior’ he was hoping for and that he felt he deserved. When he found out about his mark, he was very upset. We didn’t care about the grade, but he did. He felt it was unfair and we encouraged him to do something about it if that was how he felt. He wrote to the teacher and didn’t get a response. He wrote again and the teacher told him that he was going to consider it and get back to him. He didn’t hear back and wrote again and ultimately he was told that he needed to state his case for why he felt he deserved the ‘superior’ mark. We had nothing to do with it and stayed out of it on purpose, because we didn’t want the teacher to think he was dealing with grade-crazed parents that were pulling the strings behind the scenes. I found out today that his teacher changed the mark to a ‘superior’. I didn’t even have time to talk about it with Eric because he mentioned it casually as he was leaving for school this morning. I’ll tell you what though. I am proud of him. I am really proud of him. I could care less about his grade. I’m proud that he stood up for himself and felt empowered to advocate for himself based on something he believed in. What a remarkable achievement for someone his age, for anyone at any age, for that matter. Praise focused only on outcomes can put more pressure on our kids to feel like they need to achieve those outcomes to be successful. Praise that is focused on working or studying hard, practicing, or advocating for oneself the way that Eric did is reinforcing the hard work that he put in. Of course, it’s great to get the win, but I want to tell him that what I am proud of has to do with what he did and not the grade that resulted. 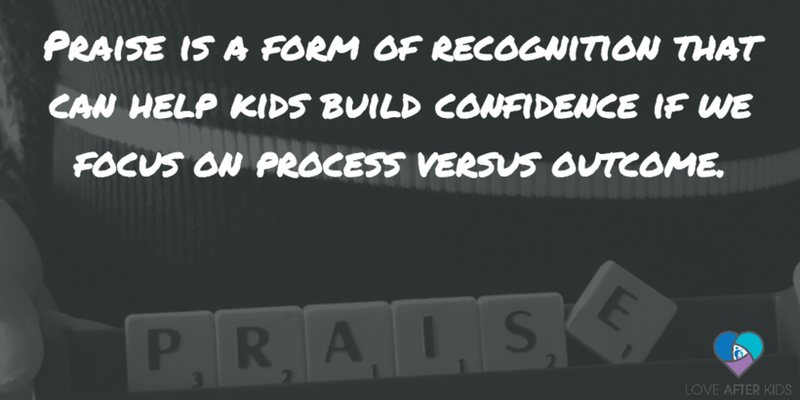 Praise is a form of recognition that can help kids build confidence if we focus on process versus outcome. I can’t wait to hug and kiss Eric when I see him later and to tell him not just that I am proud of him, but to explain to him why. Maybe I’ll even allow just of a bit of it to sink in for myself. Originally published at www.huffingtonpost.com on May 17, 2017.